London is one of the best exciting cities to spend some time while in Europe for your once in lifetime discoverable or adventurous holiday vacations. This city is located in England ranked to be more exciting with beautiful places to explore, attracting things to see and nice places to spend some nights accompanied with all fantastic meals including breakfast, lunch, evening or afternoon coffee and dinner. Is it your time in London or you are already in London, then if so listed below are the best ranked and recommended places to have an afternoon tea while on your holidays in the exciting London. Try a hot cup of tea at this tea shop and i promise you will not be disappointed, it is located along Brook Street, Mayfair, London W1K 4HR, UK. Claridge’s is ranked among the most exciting five star luxury hotels in the World. Do not miss out visiting this luxurious and exciting place for the afternoon cup of tea while in London for your holiday vacations. Shop & Do is a not bad idea to enjoy a tea party in abnormal way. Usually you will be served a cup of beer, sandwich, and savoury scone. Of course, Shop & Do also has many different kinds of traditional cakes and tea to serve for diner. This is located along 9 Caledonian Rd, London N1 9DX, UK. Spending your amazing time in Bea’s of Bloomsbury, you will be granted opportunities of tasting sweet cupcake or soft moist brownies accompanied with a good cup of tea. There are also other different kinds of tea to enjoy on a visit to this amazing place in London. Visiting the exciting Ritz you will be served with a cup of black tea and different kinds of cakes covered with clotted cream. Space of the Ritz reminds us of the fairy tales. Fortnum and Mason has more than 300 years of history, this place is the best choice for connoisseurs. Even the prissiest guest will feel satisfied with the tea flavour served while in this exciting place. Fortnum and Mason not only maintains traditional tea party, but also is characterised with many beautiful tea rooms that take the available guests to interesting experiences and excitements. This exciting place to go was established in 1707 by William Fortnum and Hugh Mason. Usually it is very hard for most of visitors to London to ignore the wonderful and exciting things in Berkeley. Their cakes baked are decorated like Moschino bag or strange looking shapes. Bake-a-boo is not only characterised with traditional dishes in their afternoon tea menu but also has many dishes with less or no sugar and milk. It is good for those who want to enjoy an excellent afternoon tea party while in London. This exciting place to go serves Asian cakes and Chinese plus Japan tea instead of English tea and cakes. Seaweed brown bread and mango chiffon cake are extremely delicious and the best choice for many visitors to this exciting place in London. Teanamu Chaya Teahouse is located along 4 Melina Road, Shepherd’s Bush, London W12 9HZ, UK. This is a decorated shop with Viennese style, the Delaunay serves jam and whipped cream, a selection of classic Viennese cakes. Most of visitors to London for holidays prefer visiting the Delaunay for the afternoon tea because of the exciting, delicious and fantastic meals served plus the quality services offered to clients. The location of the Delaunay is 55 Aldwych, London WC2B 4BB, UK. This was opened since the 18th century and is located along 288 Kew Road, Richmond TW9 3DU, UK. Original Maids of Honour serves tasty cakes which are delicious. While in Original Maids of Honour you will enjoy unforgettable meals at affordable prices starting from just fifteen pounds. Usually many tourists not only come to Kensington palace to visit ancient architecture but also enjoy delicious meals or royal afternoon tea served at Orangery. Orange scented and currant scones served with Cornish clotted cream and English strawberry jam have their own characteristic and seem to be delicious and fantastic. The Orangery is located in Kensington Palace, Kensington Gardens, London W8 4PX, United Kingdom. 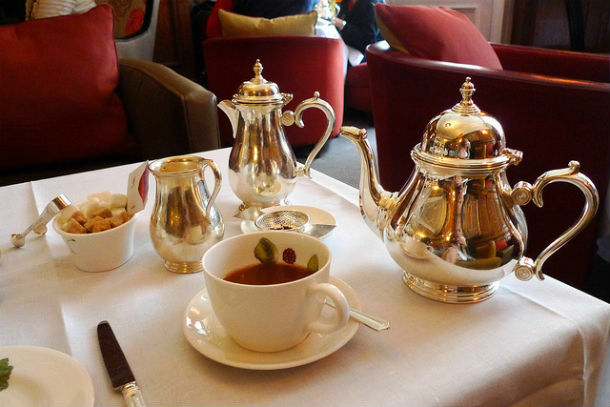 Visitors to London are attracted by cosy space and amazing tea menu served at Le Chandelier. This is really highly recommended and ideal place for families and friends to have an afternoon tea in London.